You shouldn’t have to wait until Shavuos to enjoy a slice of cheesecake with your morning coffee! 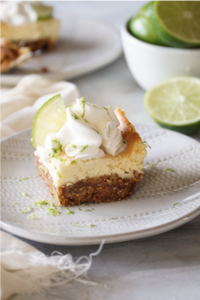 These Kosher for Passover lime cheesecake bars are the perfect balance of zesty lime and sweet creamy cheesecake goodness. Preheat oven to 350 F. Line an 8×8 inch pan with parchment paper or spray with cooking spray. Mix together the crumbs, sugar and butter, until it resembles wet sand. Press the crust into the bottom of the pan. Bake for 10 minutes, and then set aside to cool. Sara is a certified chef who trained in classic French and Middle Eastern cuisine at the Jerusalem Culinary Institute. Her background includes recipe development, styling, and photography for an array of clients. You can follow her daily projects over on @tomatoes_tomahtos.com.